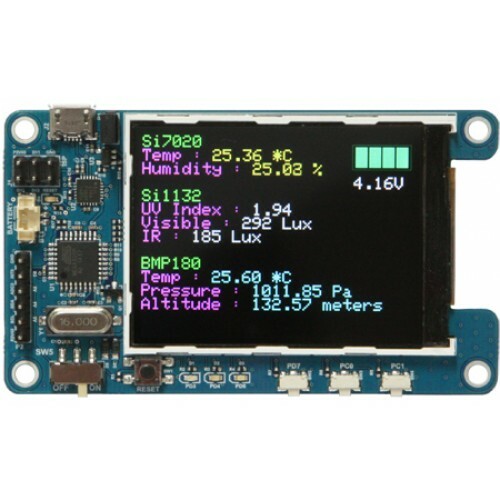 The ODROID-SHOW is the Arduino compatible that lets you see what your ODROID or PC is thinking using a small 2.2” TFT LCD. You can show colorful texts and pictures via USB interface with VT100/ANSI style commands without big HDMI monitor. You can connect this tiny display to your ODROID as well as Mac, Linux PC, Windows PC even an enterprise server. The form factor is designed for stacking on the ODROID-U3 and it comes with some PCB spacers and a USB cable. There are I2C, ADC, GPIO pins for further expansion. We will introduce an add-on board with some sensor chips. You can make it portable device with on-board charger by adding a 750mAh Li-Po battery. Because of very low power consumption, this is very useful for Wearable projects.